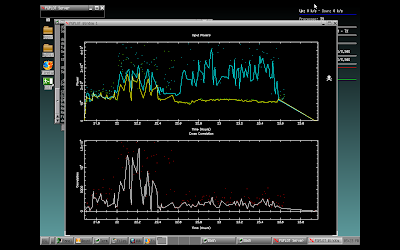 Visual Astronomy: First Interferometry Data! Today we mounted our interferometer to the roof of the engineering building and left it recording for a few hours while we went to Arby's. Below is the (noisy) data we captured. Although its incredibly noisy, it proves that the interferometry function is working properly and both amplifiers work well. Check it out below! First interferometry data from Project Odin. Note the rise in signal strength on the bottom chart (the interferometry) near 22:00 (Time is incorrect, it was actually near noon local time). This corresponds to the time in which the Sun moved through our beam pattern! Note that because of RFI and short timespan, the typical fringes are missing. Over the next week, we will be running the radio interferometer continuously, in a more radio-friendly environment. I can't wait to see the results! Ngày 8 tháng 3 sắp đến, hay dành lời chúc ngày 8/3 dành cho mẹ và tin nhan chuc mung ngay 8 3 hay nhat đến những người mẹ, người phụ nữ mà mình yêu thương nhé. Many thanks for that mind upward guy; we anticipate this particular each year. Bound to obtain the time right here, even though we do not are able to afford when I purchase composition. Right now follow-up Cash Advance Will not skip this particular for that globe!